Unlike Lithuanian crafts, which are based chiefly in the countryside, Latvian crafts, both urban and rural, have been closely interrelated since the early Middle Ages. This led to the production of objects that were very diverse yet stylistically similar, which, in turn, resulted in the evolvement of generally accepted artistic and technological techniques. 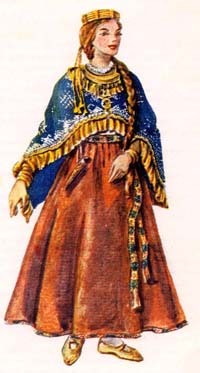 Popular Latvian crafts were pottery, embroidery, weaving, leathercraft, knitting, metalwork, and woodwork. Lathe-turned objects were generally decorated with ornamental bands of different widths, sometimes touched with color. Musical instruments, furniture for peasant homes, and some ta-bleware were made by similar methods. Geometric and plant motifs decorated distaffs, saltcellars, and the lids of large round boxes. The carved designs decorating domestic objects in Latvia are based on large clear-cut forms and strong rhythms. In addition to wooden utensils, Latvian peasants wove containers from tree roots and made birch-bark articles of every size and description, which were decorated with carved or stamped designs. Vessels woven of roots were large and solid-looking; their surface, formed by closely intermatching roots, is rough to the touch. Despite the limitations imposed by this weaving technique, their patterns are extraordinarily varied. Latvian birch-bark boxes, recalling northern Russian containers, look light and airy in comparison, an impression which is enhanced by their pleasant geometric ornamentation of simple elements. Articles made of hollowed pieces of wood were also common, especially large thick-walled bowls, the shapes of which bring to mind smoked and burnished earthenware.